Dr. Lahanas feels that excellence in teaching as important as research pursuits. He has taught a wide variety of courses including general biology, human anatomy, comparative vertebrate anatomy, evolution, animal behavior, general ecology, environmental science and tropical rainforest ecology. His research and education has taken him to 15 countries in North America, Latin America, Europe, Africa and Madagascar. 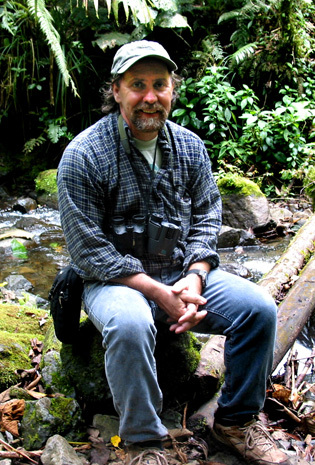 Pete Lahanas’ research focuses on Neotropical amphibians and reptiles (especially turtles), but pursues an active interest in entomology, ornithology, mammalogy, botany and geology as well. Areas of research have included various life history parameters, population ecology, sexual selection, systematics, phylogenetics, biogeography, ecological molecular genetics and conservation genetics. His dissertation investigated historical biogeographic relationships between Central and South America as elucidated through a cladistic analysis of Neotropical amphibians and reptiles. 2011 Aggregation behavior in a neotropical dendrobatid frog (Allobates talamanacae) in western Panama. Behaviour 148(3): 359-372. 1997 The genetic composition of a green turtle feeding ground population: Evidence of multiple origins. Marine Biology 130:345-352. 1996 Phylogeographic and population structure of the Atlantic and Mediterranean green turtle (Chelonia mydas): A mitochondrial DNA control region sequence assessment. Molecular Ecology 5: 473-483. 1995 Molecular evolution and population genetics of greater Caribbean green turtles (Chelonia mydas) as inferred from mitochondrial DNA sequences. Genetica 94: 57-67. 1994 The function of near neighbors in decreasing call latency period in the túngara frog, Physalaemus pustulosus. Biotropica 27: 262-265. 1992 Historical biogeographic relationships between Central and South America: a biochemical, phylogenetic analysis of selected amphibians and reptiles. Ph.D. Dissertation, University of Miami, Coral Gables, Florida. 1992 A new species of caecilian from the Peninsula de Osa of Costa Rica. Copeia 1992: 703-708.